I often get general questions about becoming a flight attendant or what it’s like to be a flight attendant and how a life as a flight attendant looks like. It’s so fun that I get so many emails from your readers who are wondering, so I decided to write this blog post with answers to ALL your most common questions about how life as a flight attendant is. 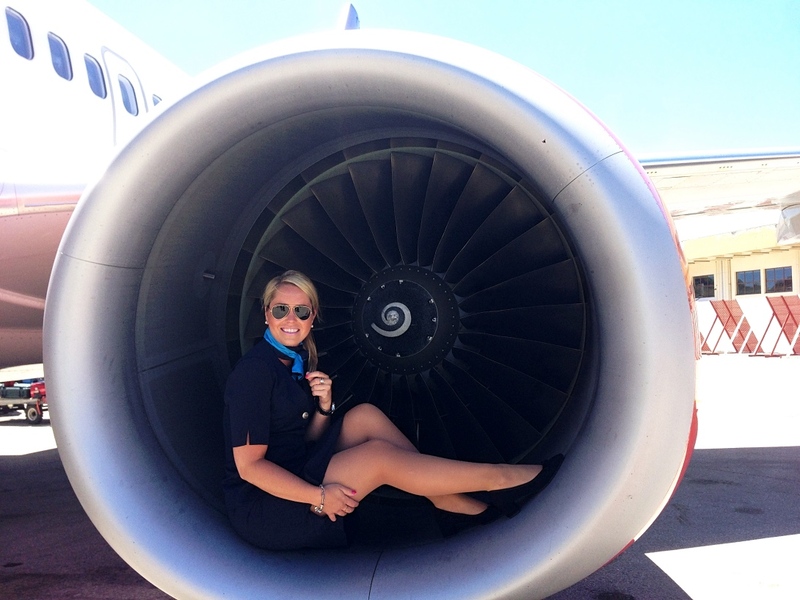 In this post, I will answer your general questions about being a flight attendant, how to become a flight attendant and what to consider in order to become a flight attendant from my own experiences. There are different ways to become a flight attendant but what I strongly recommend is to check the airlines’ websites. 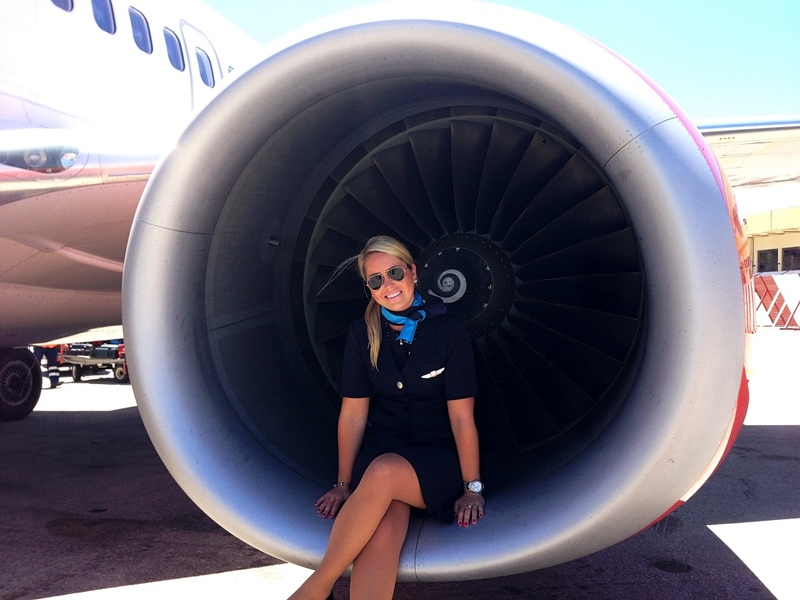 Some companies are looking for air hostesses with experience, others not. Good to know is that you get the training from respective airlines. You can always apply but many airlines request that you have at least completed high school. When I became flight attendant for Qatar Airways I saw their advertisement in the newspaper Metro and decided to go their recruitment day. If you are good in different languages and have experience from the service industry / hotel / tourism it is a big advantage! How does the recruitment work? During the interview for Qatar Airways, I received a few simple tests such as English tests, a group test and personal interview in English. I also needed to write an essay in English, due to they wanted to see if I could write and understand the English language. Also for SAS, this was similarly things I needed to do. 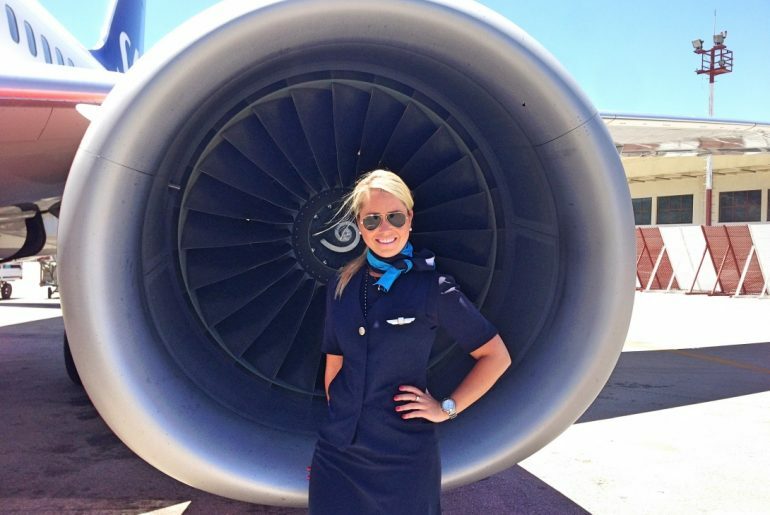 Why did you become a flight attendant? What is your best travel destination? I have many favorite destinations, everything from South Africa to the Maldives, Rome, Shanghai and Tokyo. Hello, I’m really interested in becoming a flight attendant. But I have difficulty finding an education for that. Do you have any tips? Specific flight attendant training doesn’t exists anymore. You have to apply to become a flight attendant to each airline and if you get accepted, you will get the training from the airline, which usually lasts for few weeks. That’s how it is for almost all airlines today. My tip is to enter the airlines webpage you are interested in working for and apply on their career page. How is it to work as a flight attendant? It’s amazing! One day is not the same as the other. If you like service and meet people it’s the best job in the world! Best of all, it doesn’t even feel like a job because it’s so fun. I have never felt that at any other workplace. However, it should be added that it is very hard in the long run. The jet lag takes over your body more than you think and it is not as glamorous as many think. In addition, you learn to master all kinds of people, both good and bad. You also work in different teams every time, which makes you get to know many colleagues! Do you have to be 21 years old? I have read on several pages that you have to be at least 18 years old. Another issue is that I have been working at a cafeteria for 2 years now, can it count like I have experience from service? All airlines have different criteria, some have an age limit of 18 years and others have a limit of 21 years. I would recommend you to go the airline you are interested in, on their website and read under “career”, which usually indicates what criteria that specific airline has. It’s a great experience of working in the service industry earlier, so your job is a good reference. What is the most odd thing that happened to you as a flight attendant? As a flight attendant you have spent many hours in the air, what are your best tips for upcoming travelers? How does the schedule usually looks like? Is it often return the same day, or usually one or more nights away? How many nights counts to be a weekly full-time job? On Qatar Airways, it was usually long haul flights I had where I left for several days. For example you flew to Doha – New York and then you where there for 2-3 nights and then you returned back from New York to Doha. At SAS, there were a lot of back and forth flights on one day, such as Frankfurt and Oslo. It is also common on SAS to have “slingor or loops” as it is called. For example you have a 5 day loop that is shown on your schedule, which means that you are away from home for 5 days and sleeping in different places within Sweden and fly in between. For example Stockholm- Gothenburg -Stockholm- Umeå, sleeping in Umeå and departing the next day from there. Those who fly long haul flights on SAS for example have the similar arrangements as Qatar Airways has on their long haul flights. Are you staying at a high risk hotel at the airport, or in the middle of Manhattan or on a beach resort? It is normal standard on the hotels, both at SAS and Qatar Airways, so no risky hotels. In some destinations, you live in the middle of the city and at other destinations right at the airport. But it is good standard of the hotels! That’s how I have experienced it at least on the airlines I worked for. Everyone knows that the flight attendants hate when passengers need to go to the toilet. When should we actually get to the toilet without crashing a carriage or service? It’s hard to do but choose your occasions. Please go to the toilet before boarding and try to do it when a carriage has passed you, if you have to do it during the flight, which will make it easier for everyone. Alternatively, go to the toilet in the back if you see that the cart is rolling into the cabin from the front. How long should the flight be before you can sleep after the service? Can you choose when you want to rest or are you sent into the wardrobe according to a schedule that Ulla-Bella on the ground has developed before? The “wardrobes” at the back of the plane are called “rest modules” on SAS. There are seats that are blocked for the crew to be able to rest on long haul flights, such as USA. After the service, the crew will work in shift where some rest a couple of hours to eventually switch. At SAS there are seats, on Qatar Airways there were real beds. All airlines have different but most common are beds. The schedule is made at the briefing the same day before the flight takes place when the crew gathers and goes through the flight and who works at which position. It is therefore the purser who decides on board who also determines the schedule for rest periods, depending on how long the flight is. How does it work if multiple flight attendees on the same flight get sick at the same time and can’t go to work? Or if there is an accident on the highway, and nobody is coming forward? Does each airline have a spare pool ready for the airport, ready to jump in? There is something called “standby”. It means that you have to be available at a certain time if any colleague becomes ill or unable to arrive at work on time. If the airline calls you, you must quickly get to the airport in your uniform to check in with your crew. This is scheduled for each month, so you know in advance when you have to act “standby”. So yes, every airline has a spare pool ready at the airport or at home, prepared to be able to jump in when necessary. Why do all flight attendants always have a normal suitcase and a cabin bag, even if the trip only goes to Östersund? They may not be away from home so long that they need so much baggage? I never have so much with me, even for two weeks. At SAS you are usually away for several days, so the flight attendants carry both a normal suitcase and a cabin bag, although passengers think they only fly to Östersund back and forth, they may be gone for example 4 days without you as a passenger knows about it. Is it true that flight attendants “weight should be in proportion to length”? Is it included in the uniform to have high heels? What happens if you don’t wear makeup? It is part of the uniform to have high heels. 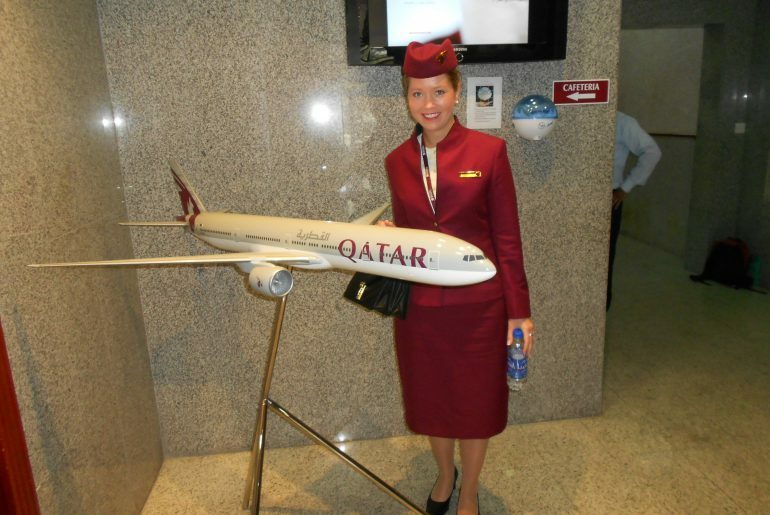 At Qatar Airways, they provide all uniforms for you, including high heels. SAS also includes high heels in the uniform but it’s not as strict to wear makeup if you don’t want to as it is on Qatar Airways. As long as you look fresh and have your hair set up for hygiene, it’s ok. But I never think I’ve seen a flight attendant without makeup, it’s very rare. What is your longest flight? Your biggest aircraft you been flying? My longest flight has been Doha – Sao Paolo in Brazil which took almost 17 hours (2013). The biggest aircraft I have flown as flight attendant is Boeing 777 (2013). The coolest airplane I know is the A380 which is the “double decker”, the one that has two full floors. I have flown it privately as a passenger but never on duty. Unfortunately, you will not be able to decide which aircraft type you want to work on, you will be assigned that by the airline. During my time (2011-2013 Qatar Airways didn’t even have Airbus 380, it came afterwards). Can you fly if you are pregnant as a flight attendant? Yes, up to a certain month into the pregnancy for SAS at least. Then you will be moved to work on the ground or at the head office for the rest of your pregnancy. At Qatar Airways you were fired if they found out that you were pregnant (2011-2013). What is your disgusting, strangest or most nasty experience? Have you seen any cut their toenails or have you had first aid rescue? I’ve seen many cut their toenails, really disgusting. Don’t know if it’s less nasty than getting a blanket filled with vomiting in your arms without knowing about it, which has happened to me too. The most terrible experience was a flight from Doha to Tokyo in 12 hours where a passenger suffered a heart attack and died unfortunately. 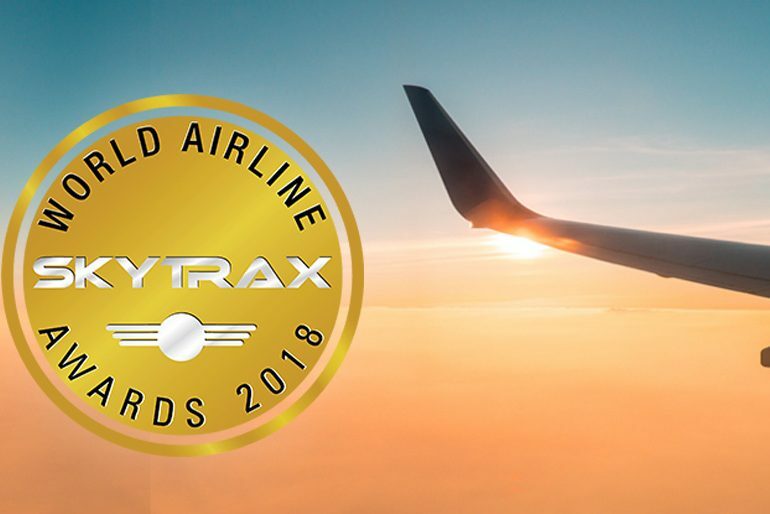 We performed cardiovascular and pulmonary rescue but unfortunately we couldn’t save the passenger’s life and we had to do an emergency landing in China and then continue the trip to Tokyo – that flight was not fun, but I also became an experience richer. Do you have more specific questions about a life as a flight attendant, please comment! 🙂 You can also read more posts I wrote about my life as a flight attendant if you click on this link. Follow my adventures on Instagram here, Facebook here, Bloglovin here or sign up on my Youtube channel here! jag undra, får man ha lugg som flyggvärdinna?